The Mendelssohns were Anglophiles. They loved English customs and spoke the language fluently. They consumed vast quantities of English tea unlike most of their Berlin neighbors. They read English writers mostly in English, including Shakespeare and Sir Walter Scott, often before their books were available in German. It wasn't surprising, when Felix had a chance to travel on his own, he chose to go to England. During his first trip – in 1829 when he was 20 and this portrait of him was painted – George IV was king. Jane Austen, who had died 12 years earlier, was the famous writer of novels like “Pride & Prejudice” and “Emma.” Her books reflected life during “The Regency” with plots superimposed on the family's concerns for respectability and getting the daughters married to respectable husbands to ensure their fortune. His next several visits were during the reign of William IV, younger brother of the previous king. Following his honeymoon in 1837, Mendelssohn visited London to perform his new 2nd Piano Concerto, arriving a few months after the death of William IV when Victoria became Queen at the age of 18. Victoria enjoyed music and liked to sing. Her husband, Prince Albert, either accompanied her or sang duets with her after dinner ( he disliked the English custom where, once the meal is done, the men stayed in one room and smoke while the women went to a different room and talk). He was also a fine organist. It wasn't until his visit in 1842 when Mendelssohn, already a musical idol to the London audiences, met the Royal Family. He first met Prince Albert who invited Mendelssohn to come to Buckingham Palace to play the organ there and when he arrived, he found the prince alone in the music room. While they were talking, the Queen walked in by herself, dressed in a regular house-dress, no state robes or any formal escorts – we always seem to think the Royals sit around in these outrageous court costumes – and flustered because they were getting ready to leave for a country estate for a holiday. Wind from an open window had scattered loose pages of sheet music from the organ all over the floor, so she hurried to pick them up and sort through them. Albert then played the organ for Mendelssohn while the Queen listened (see illustration, right). Then Mendelssohn sat down to play for them. When he started playing a chorus from his oratorio, St. Paul, the royal couple both started to sing along. Later, Albert said to his wife she should sing for Mendelssohn but she couldn't find the sheet music she was looking for – it had already been packed for the holiday. Eventually, they found it and Queen Victoria sang for Mendelssohn one of her favorite of his songs. Accompanying her at the piano, he diplomatically had to correct her when she sang a wrong note. The only thing was, it was not by Felix Mendelssohn – it was by Fanny Mendelssohn! It was one of his sister's songs he'd published under his name just to get it published and before the public (it wasn't that he was trying to steal credit for it). He wrote all this down in a letter to his family back in Berlin, telling them he had to admit (joking that “pride goeth before a fall”) the composer's true identity. Victoria recorded this fact in her own diary but made no comment about her reaction to the deception. By the end of the visit, Mendelssohn asked the Queen if he could dedicate his new symphony to her – this would be the “Scottish” Symphony – which he was soon to premiere. She accepted and gave him a beautiful ring engraved with her initials and the date, 1842. By now, Mendelssohn had become the most popular living composer in England: all the Royal Philharmonic had to do to make a financial surplus from ticket sales was program some of Mendelssohn's music. His sweet style – not too “heady” – resonated with the English audiences. Unfortunately, the London musicians could make no sense out of Schubert's “Great” C Major Symphony which Mendelssohn had just premiered in Leipzig – they rebelled at its length (over 45 minutes) and found it tiring to play. So Mendelssohn withdrew it from the program and refused to premiere a new overture of his everybody had been waiting for. He was the Pied-Piper to English music-lovers. When they asked him to take over the directorship of the Birmingham Choral Festival, he declined, but agreed to write them a new oratorio – based on Elijah – which he'd come back and conduct for them. Here's something typical of Mendelssohn's traveling: in 1842, he left Birmingham as soon as the performance of St. Paul was over, about mid-afternoon, arriving by coach in London around midnight. He took the mail-coach to Dover, arriving around 9am to catch a boat without taking time for breakfast so he could get to the steamer that would take him to France – he was seasick, as usual – followed by an immediate coach-ride through Belgium to the Rhine. There, he immediately caught a steam-boat that got socked in by fog in the middle of the night, so he got off the steamer, was rowed to shore where he caught one coach before switching to another at 3am to arrive in Frankfort where he met his wife, Cècile, whom he'd left there visiting family and friends. Immediately into another carriage, it took 3 days to reach Leipzig where he arrived at 2pm. He walked out on stage at 6pm that evening to conduct the first concert of the season with the Gewandhaus Orchestra. After the concert, he admitted to being a little tired... following nine continuous days of travel, the 19th-Century equivalent of jet-lag. After he returned to Leipzig, he started work on founding a new music school there, comparable to one the Prussian king had proposed for Berlin but which several years later had still never gotten off the ground. The next spring, Leipzig's new conservatory (see left) opened to take in its first students with Mendelssohn as its director. He asked Robert Schumann to teach composition and Clara Schumann to teach piano. Later, he would conduct the premiere of Schumann's Piano Concerto with Clara Schumann at the piano. There was also an old friend he brought in to teach the violin, Ferdinand David who was the Gewandhaus Orchestra's concertmaster or principal 1st Violinist. A year later, Mendelssohn would begin composing his Violin Concerto for him (you can hear two prodigies play the last movement of it in this music-video post). During Mendelssohn's lifetime, the concert experience was primarily a hodge-podge of orchestral works (sometimes excerpts) interspersed with piano solos or chamber music or songs and short choral works. Most of the music was written by living composers or those – like Beethoven – who may have died only recently. Mendelssohn regularly began to program more “old music,” especially by Bach and Mozart, something unheard of then. He would mix old and new music with a soloist playing a concerto or singing a group of selections which became the formula still heard in most symphony concerts today. Another fairly new idea was “the conductor.” Even in Beethoven's time, most orchestras were led by the concertmaster or the principal 1st Violinist (Odin Rathnam, who'll be performing on September 16th with friends of his from the West Branch Music Festival, is also the concertmaster of the Harrisburg Symphony). But as the music became more complicated and concerts became more varied, the concertmaster went from sitting at the front of the violin section to standing in front of the orchestra, conducting with his violin bow. In 1820, violinist Ludwig Spohr used a short wooden stick called a “baton” to beat time with so the musicians could follow him better. This is usually how conductors today still communicate visually to the musicians. 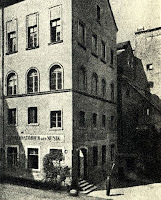 As there was a “Mendelssohn House” in Berlin where Felix grew up, there was now a “Mendelssohn House” in Leipzig (see left) where the composer lived with his wife and children. They had five children over a period of seven years but none of the children exhibited any musical talent. Cècile was considered a “placid” temperament who might help keep her husband calm but she did not inspire him to compose or shift his music to any higher level of intensity, intellectually or emotionally. It seems he didn't really discuss his music with her – that, he still reserved for his sister as he had always done. If anything, as some friends noted, his music became stuck in a more comfortable rut. That might not hold true for some of the works he composed in those years – finishing the Scottish Symphony, the Violin Concerto and most of all, the music for A Midsummer Night's Dream. It may be a criticism of the 2nd STRING QUINTET he composed in 1845, the year after he'd finished the Violin Concerto and two years after the Midsummer music: it's too comfortable, pleasant enough but perhaps too close to trying to recapture the spirit of the Octet he'd composed 20 years earlier. 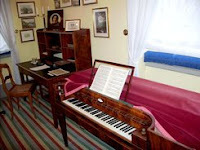 This small corner study was where Mendelssohn composed, using a tiny spinet piano. On top of the desk's shelf is a portrait of his sister, Fanny, and on the wall (at least as its maintained now that it's a museum) are framed water-colors Mendelssohn had painted during his travels. Mendelssohn frequently played for his wife and the children. Even though she was entirely devoted to him and his music, Cècile's favorite piano pieces were by Frederic Chopin. At one point, Mendelssohn writes a fan letter to Chopin asking him for a scrap of music written down with his autograph and a dedication to his wife. The music room here was for his own music-making: friends would stop over to play music or famous guests when they were in town. He did not have time to organize anything as regular as the Sunday musicales of his childhood. After his mother's death in 1843, Mendelssohn inherited the Berlin family home which without a thought he gave to his sisters. Fanny was still holding the musicales there on her own. Much of Mendelssohn's biography reads like an appointment book – works he composed or conducted in Leipzig or London, responsibilities he took on or didn't. He wanted to write a new symphony and considered several possible subjects for an opera but rejected them all. He heard the great soprano Jenny Lind (“The Swedish Nightingale” as she was called) and fell in love with her voice (there was an unsubstantiated rumor that he may have fallen in love with her, but there's no proof of that). He wrote the soprano solo in his new oratorio with her voice in mind. Unfortunately she chose not to sing the English premiere but agreed to sing the next performance in Vienna. So Mendelssohn finished the oratorio Elijah in a single burst of creative energy during the summer of 1846. As soon as he was done with it, he went off to England to conduct its premiere. 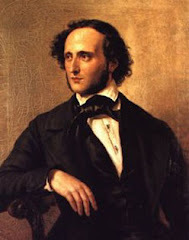 With a major work getting ready for its first performance, Mendelssohn still found time and energy to conduct a few orchestral concerts and play a Beethoven piano concerto along with several chamber music concerts, two appearances at Buckingham Palace and playing at a reception at the Prussian ambassador's home. Talk about “workaholic”! Elijah was a great success, but Mendelssohn was exhausted by the time he returned to Leipzig. He had said when he said good-bye to Victoria and Albert – after she sang three of his songs and he played through several new pieces for them – he was so tired he could hardly raise his arms. Rather than travel straight through as he used to, he had to stop three times to rest. He had only been home in Leipzig a few days when news arrived that his sister Fanny had died suddenly – she had been rehearsing a work of his for one of those Sunday musicales when she felt faint, her hands falling from the piano keyboard. She was carried to the next room but never regained consciousness: by 11:00 that night, she had died. She was only 41. When Felix received the news, he collapsed and remained “insensible for some time.” When he came to, he could not stop crying. Even though he seemed to recuperate, the shock changed him and so Cècile decided to take him away on a vacation to rest. He went back to work, getting ready for the Berlin performance of Elijah but when he entered the family house and saw the room where Fanny had died – and his score still sitting on the piano's music-rack – he broke down again and decided he could not conduct, so the performance was canceled. He would probably cancel the Vienna performance, too. He submitted his resignation to the Gewandhaus but returned to get ready for the Conservatory's new year but in early October, he was ill, though for no apparent reason. Later in the month, he had great spasms of pain – his symptoms that could have indicated a series of strokes except doctors then didn't understand them. A few days later, on November 4th, he died around 9:30 that night at the age of 38. People in Leipzig had heard Mendelssohn was ill and they waited in a vigil outside the house by the hundreds. When they heard that he had died, they stormed the house. The children had been asleep but when Cècile went to bring them in to see their father, friends had to push the crowd out of the way so they could enter the room and forcibly bar the doors. After the funeral – where a chorus of 600 sang a Bach chorale and a chorus from Mendelssohn's St. Paul – a thousand people escorted the coffin by torchlight to the train-station. That night, all along the route, people had gathered to watch the train pass, many of them singing tributes. The train arrived in Berlin at 7am and Mendelssohn was buried in the cemetery next to Fanny. Memorial concerts were performed all over Germany and in England. The Vienna performance of Elijah had not been canceled but now it was staged as a memorial to the composer. The music stands were all draped in black, the performers dressed entirely in mourning. The score rested on the raised podium that Mendelssohn would have used, a laurel wreath resting on top of it. The man who conducted the performance stood on a lower podium to lead the performance. Many in the audience wept throughout the performance. Consolations arrived from Queen Victoria who had written in her diary that she was “horrified, astounded and distressed” by the news of his death. She reflected the attitude of many of his fans, both British and German. One of the most popular musicians of the day had passed and the outpouring of grief and shock was felt across a continent. What's It All About, Art?